Daryl Francis gave Dean Harris his Manager's Player of the Season at the end of season awards evening. Daryl praised for his commitment shown to the club, nobody played more times than his 22 appearances. He has made himself regularly available and rarely complains and this despite the fact that he only played the full 90 minutes twice in his first eight matches. But after that he would make 10 further full 90 minute games, including the cup Quarter Final and an assit against Trinity. You know exactly the type of performace you will get from Dean and Daryl can rely upon him to put 100% into every appearance he makes. Player's often get knocked when they are not considered as skillful as others, but the players that go out and do as much as they can and keep solid are just as important as those who take the plaudits as match winners. Rich Jones gave Ben Thomas his Manager's Player of the Season at the end of season awards evening. He said Ever since we went to three in midfield I have been looking for someone reliable to play the holding midfielder role. 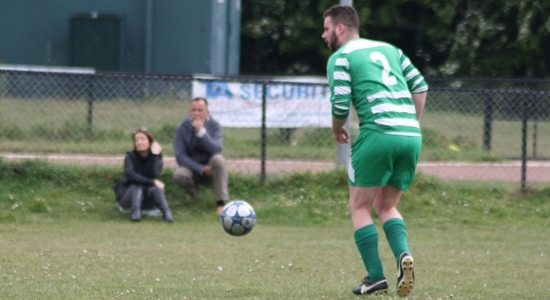 Let�s be honest, it�s not the most glamorous position on the pitch. You�re in midfield but you have to sit and watch as the players around you bomb on and grab goals. It takes a discipline very few playing at our level possess. Ben has shown this discipline and positional sense every time he has played this season. He has played the position really well, breaking down attacks and being solid in possession. Ben always looks to keep things simple and move the ball quickly to the nearest available option. He rarely tries a 'Hollywood' ball or to fire a shot in from 30 yards. For these reasons his performances probably go under the radar with some of his teammates but as a defender I can tell you it has been invaluable having that extra layer of protection. It is because of his reliability and consistency that I felt he deserved Manager�s Player of the Season.